Delicious, juicy and nutritious, the pineapple is one of nature’s healthiest foods. Native to Brazil and Paraguay, the pineapple is rich in enzymes that reduce swelling and vitamin C to promote immune health, but the pineapple also provides some major health benefits that may surprise you. An herbaceous perennial, the pineapple plant typically grows up to 4.9 feet in height. The leaves are extremely tough with a waxy appearance, and the plant has a somewhat stocky appearance. The average pineapple plant produces around 200 flowers, which produce fruit. These small individual fruits join and form the pineapple. The word pineapple was coined by European explorers in the Americas, as the pineapple fruit was thought to resemble a conifer (pine cone). What is Pineapple Tea Good For? Most commercial forms of pineapple tea contains other ingredients or other types of tea blends that promote a healthy lifestyle, often including additional health benefits. What Does Pineapple Tea Taste Like? Pineapple tea without any additives or other types of tea has a fresh, sweet, slightly tart flavor. The aroma is heartily citrus in nature, bringing forth visions of sunshine and warm breezes. Most individuals who enjoy the taste of other citrus fruits find pineapple tea to have a very pleasurable flavor and aroma. Pineapple tea is typically paired with green tea, lemongrass, ginger or chamomile. Often touted as a diet tea, popular brands such as Dr. Ming Pineapple Tea, also contains senna and licorice or some other form of natural laxative or diuretic. Depending on the brand of tea, the pineapple base often overwhelms other flavors, although flavors like hibiscus, honey, mango and rooibos typically hold their own. Pineapple pairs well with most other fruits, light teas (white and green), earthy teas like rooibos and naturally sweet flavors. Anti-inflammatory action – Pineapples and pineapple tea contain bromelain, an enzyme known to reduce inflammation. This is particularly important for individuals suffering from arthritis, according to WebMD. However, many other forms of inflammation can be improved by drinking pineapple tea or consuming bromelain-rich foods. Mood-enhancing action – In a study of hospital patients who were vitamin C deficient, those who received vitamin C most often reported mood enhancement, reports Mayo Clinic. Often, individuals who are vitamin C deficient experience fatigue and depression. Other studies support this finding, showing that vitamin C is very likely mood-enhancing, although more research is needed. Metabolic function – All of those pineapple weight loss teas may be on to something, despite the naysayers. This is due to the high quantity of manganese found in pineapple naturally. Manganese aids in bone and tissue growth, as well as blood clotting and weight loss. This is due to the fact that manganese boosts fat and carbohydrate metabolism (University of Maryland Medical Center). When a person is manganese deficient, issues such as infertility, weakness and bone loss can occur. Approximately 37 percent of Americans do not get enough manganese in their diets. Antioxidant effects – Vitamin C again comes into play, aiding in fighting oxidative stress and neutralizing free radicals. As free radicals can change DNA, resulting in diseases like cancer, heart disease and painful arthritis, vitamin C is an essential daily nutrient that repairs damaged tissue in every area of the body, suggests the University of Maryland Medical Center. Vitamin C repairs collagen, ligaments, blood vessels and helps the body absorb iron from plant based foods. It also protects the bones and teeth. In fact, one cup of pineapple juice contains 94 percent of the recommended daily allowance of vitamin C (2,000 milligrams – high end). Immunological effects – A fabulous source of vitamin C, pineapple helps keep the immune system functioning at its best to fight off infection and debilitating diseases like cancer. A 100 gram serving of pineapple contains approximately 44 percent of the recommended daily allowance of manganese, and bromelain, found in all parts of the pineapple plant is currently being researched for a wide range of clinical disorders. Pineapple is one of the best sources for vitamin C, manganese and bromelain of any other food. 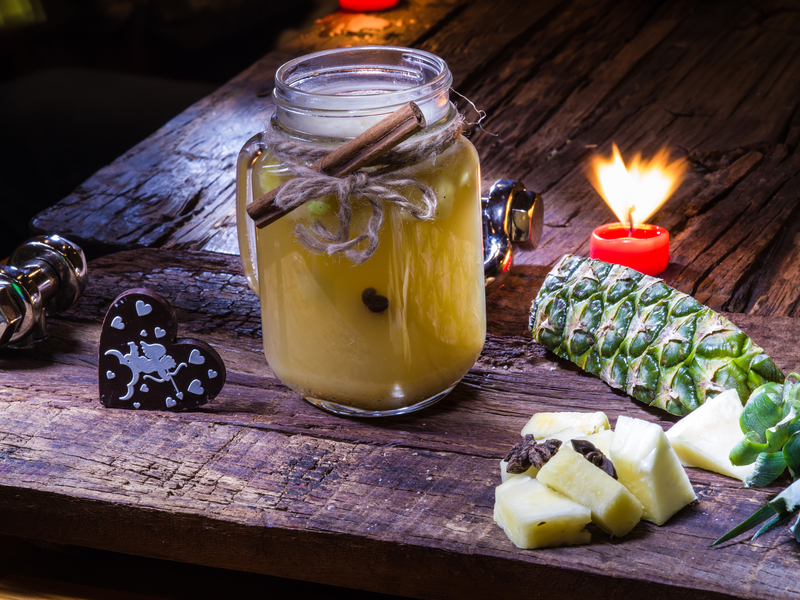 Whether consumed in teas, juices or smoothies, pineapple is an essential part of a balanced diet. Choosing pineapple tea is a great choice for year round access, even when the fruit is out of season. Are There Any Side Effects from Pineapple Tea? 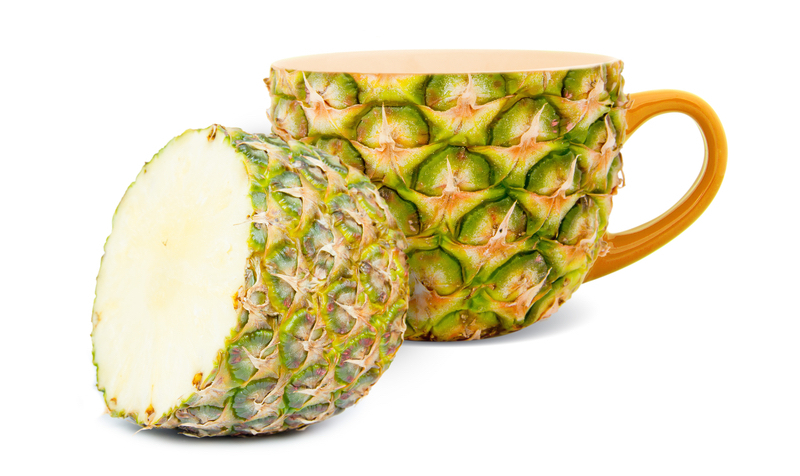 Side effects related to pineapple tea are typically related to mixed teas or medicinal teas. For instance, senna, often used as a recipe for diet tea, can lead to stomach cramps and nausea for some people. Pineapple tea with no additives is considered safe for most people, unless an allergy is present. Pregnancy and breastfeeding – There is not enough evidence to suggest whether pineapple consumption during pregnancy or breastfeeding is safe or unsafe. Some evidence suggest that pineapple has been used to induce miscarriage, although this is not scientifically proven. As many pineapple teas contain other ingredients, it is best to err on the side of caution and avoid this tea while pregnant or breastfeeding. Allergies – Some people can experience an hypersensitivity to pineapple. In rare cases, a cross-reaction with celery, honeybee venom, papain and bromelain have been reported. Unripe pineapples – When making homemade tea, using an unripe pineapple can induce severe vomiting. Bromelain – One of the main active ingredients in pineapple, bromelain can cause vomiting, skin rash and increased menstrual flow in a small number of people. Dosage for pineapple tea is typically dependent on the bromelain content. The recommended daily intake of bromelain is between 500 to 1,000 milligrams. To make pineapple tea, allowing tea bags to steep for 10 minutes in boiling water. For ice tea, follow the same procedure, adding pineapple reserve and cold water. No additional sweeteners are needed, although more may be added to taste. To make a tea to lose weight, use plain pineapple tea bags or one fresh pineapple. Simmer for 30 minutes, along with water (2 liters for an entire pineapple), and add a stick of cinnamon for flavor. Pineapple teas are readily available in grocery stores, health food stores and online. Some particularly delicious blends include Pineapple Lychee Hibiscus Tea or Pineapple Ginger by The Republic of Tea, Green Tea & Honey-Mango Pineapple from Lipton (hey, it really is good), and Good Earth’s Organic Green Tea Peach &Mango Pineapple. Anyone who suffers from fatigue or depression can get an instant pick me up with a cup of pineapple tea. Individuals who want to maintain good health and ward off serious disease like cancer can also benefit from a daily dose of pineapple, along with individuals with inflammatory conditions or those who need to kick start their metabolism. While it may seem like a warm weather tea, pineapple tea is also perfect for the winter. Typically, winter months cause more issues with depression in the form of seasonal affective disorder (SAD), and many people do not eat as many fruits and vegetables due to cost or lack of access. A daily cup of pineapple tea can lift the mood and provide an infusion of vitamin C. We also love how flavorful pineapple tea is, while also having minimal negative reactions for most people. Overall, this tea should be a staple for anyone who loves fruit.